This is one of four reports from the Beyond Abuse project. This document is the Manchester report. 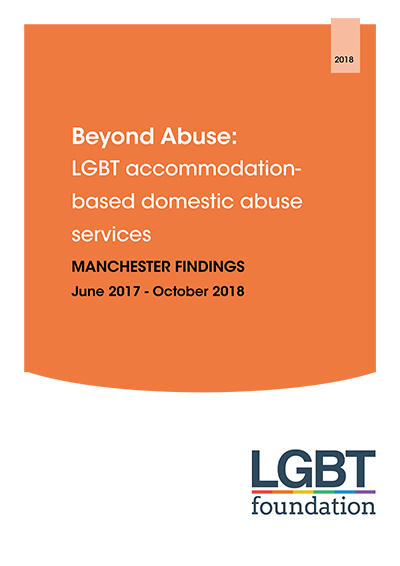 As part of the Beyond Abuse- LGBT (Lesbian, Gay, Bisexual and Trans) accommodation based domestic abuse services, LGBT Foundation have been providing a support service within the Greater Manchester Area. Similar projects were funded in Brighton & Hove City Council and the London Borough of Hammersmith & Fulham. Brighton Rise and Stonewall Housing provided these services. Due to all running similar projects through the same funder, a national partnership was formed between all three agencies. Locally, Manchester City Council, who were successful in getting this bid, has supported LGBT Foundation. Independent Choices provided casework supervision for the worker in the project. In terms of housing, LGBT Foundation collaborated up with both Great Places, who provided three housing units, and City West Housing Trust, who provided one. All of the findings in this report have be collected via the use of demographic forms, monitoring databases, and initial risk assessments with clients. All data has been anonymised. This data was collected between 1 August 2017 and the 15 October 2018.